ept’s German plants hold an annual raffle. The raffle is very important to employees because they are able to use the proceeds to support social projects throughout the region. At the plant in Peiting, Germany, the raffle was organized by first- and second-year apprentices. In Buching, the raffle was held by the plant’s works council. Over 1,850 tickets were made and sold at the plants in Peiting and Buching in mid-December. The prizes were provided by the company’s suppliers and business partners. ept employees were presented with a variety of exciting prizes, ranging from gift certificates for rafting trips and spas, spices and books, and many smaller prizes such as wine and gingerbread. 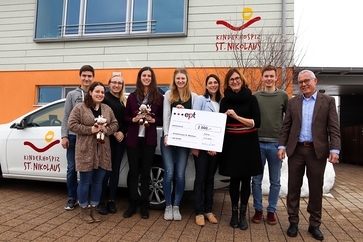 The donation ceremony took place at the St. Nikolaus Children’s Hospice on 17 January 2019. Brigitte Waltl-Jensen from Kinderhospiz im Allgäu e.V. accepted the symbolic check and provided us with information on the structure of the institution and the work done there. The children’s hospice has been caring for children with incurable, terminal illnesses and their families since March of 2007. Apprentices Thomas Huber, Lea Metty, Lea Holzmann, Anna Eder, Magdalena Wölfl, their instructor Barbara Deininger, Brigitte Waltl-Jensen from Kinderhospiz im Allgäu e.V., Maximilian Lory, and HR Manager Joachim Ruber at the ceremony to present the symbolic donation check. Students of the Steingaden Middle School accept the valuable scroll saw. The donation to the mountain rescue team of Steingaden and Peiting was presented at the ept plant in Buching. Pictured here: Norbert Stowasser (ept works council), Roman Degle (mountain rescue team), Magdalena Guglhör, ept apprentice Magdalena Götz. 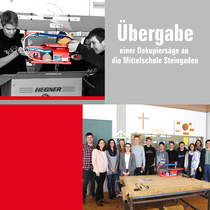 On 31 January 2019, the raffle organizers and their instructor presented the Steingaden Middle School with a scroll saw for their workshop. Teachers and students were excited about this donation in kind, which will allow students to practice precise woodworking skills. The donation included an invitation for students to visit the main plant in Peiting. During the visit, 8th-grade students learned all about the apprenticeship careers and were able to ask questions about the application process. The instructors took plenty of time to familiarize visitors with all of the production departments. On Valentine’s Day, Roman Degle, representing the mountain rescue team of Steingaden and Peiting, accepted the symbolic donation check for over 2,000 euros at the ept plant in Buching. The money will be used to support the construction of a new mountain rescue station. In order achieve their goal, the rescue team will be expanding their existing garage for 180,000 euros. The renovation must be funded by the team itself as well as by donations and grants from surrounding communities. The donation from the ept employees therefore comes as a welcome gift.